The Wow Signal takes the Group 2 Coventry Stakes for Frankie Dettori and Al Shaqab. 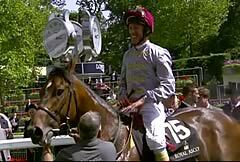 Frankie Dettori gets the most out The Wow Signal & its a Irish-bred 1,2,3,4. Dettori: "I'm two away from 50 Royal Ascot wins - it'd be dream to achieve that this week." The Wow Signal won the Coventry Stakes in good style, gaining the plaudit from trainer John Quinn of being: "The best I have trained." Malton-based Quinn was speaking after Frankie Dettori had ridden the colt to victory by one and three-quarter lengths and a short-head from Cappella Sansevero and Jungle Cat. Winning owners Al Shaqab Racing were completing a double having also won the opening Queen Anne Stakes with Toronado. This was The Wow Signal's first run for his present owners - he was bought for £50,000 at Ascot breeze-up sale in April and had won his only previous start - at Ayr - for owner Ross Harmon, who sold him to Al Shaqab following that run. The Wow Signal was immediately given quotes for next year's QIPCO 2000 Guineas, with Boylesports and William Hill were offering 16/1, and Coral going 20/1. Quinn said: "He worked on Saturday morning and I nearly crashed my four by four trying to keep up with him. We thought he was very good, but you need a top-class colt to win a Coventry. I'd have been disappointed if he wasn't in the mix, but this is the Olympics so I'm over the moon. "Six furlongs here is fine, but this fellow is crying out for seven furlongs and a mile. He will turn up in the Guineas next year with a good chance. He had to run and win today, but he's very good and I'll campaign him this season accordingly. I'll talk to Harry Herbert [Al Shaqab's racing advisor]. "I expected him to win at Ayr, but a horse he was working with at home was beaten at Hamilton and that just made us think. Then he won at Ayr and the form was franked and franked - you can't fake that. I'm so, so pleased to have him and so pleased Harry Herbert bought him. "Plenty of other people wanted to buy him to take him out of the yard, and I said to the owners, 'God, if this one goes I might never get another as good', but Harry matched the price and was the first to say he would leave him with me. I'm very grateful for that. "He's come and beaten the best colts available today, comprehensively and wasn't held up but was right on the speed. I think he deserves a lot of credit, because horses came from out of the pack and couldn't get to him. "You don't tell Frankie Dettori how to ride Ascot, but the one thing I said was he has huge cruising speed." David Redvers, representing Qatar Racing, the owners of runner-up Cappella Sansevero, who they bought yesterday for £1,300,000 at Goffs London Sale, said: "He's run very well and clearly got every yard of the trip. My initial suspicion is that they went very hard in front and the winner is obviously a very good horse. Well done to them, but ours is a horse with a future."